Finally there is a way that you can analyze web hosts before you pull out your credit card and make the move. With the Host Evaluator software you can add the web hosting plans you want to compare, and test out the servers of web hosting companies. 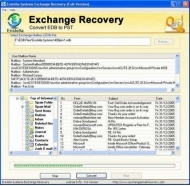 Repair EDB file and recover data from inaccessible Exchange server in readable mode by using PDS best Exchange EDB file repair software. This is the perfect solution to repair corrupt EDB file and for Exchange recovery EDB to PST file. Modifications done by any user within the network will be notified to the IT administrators via Group Policy Auditor. Also, this tool helps you meet regulatory compliance standards like HIPAA, PCI, SOX, and GLBA etc.